Visual Inspirations Australia is a creative agency formed by a team of innovators and artisans. We design, manufacture and supply large scale Christmas displays for shopping centres and commercial buildings all over Australia. Last year our Perth based client at 108 St. George’s Terrace briefed us in on their idea to have a New York Style Christmas display, designed and manufactured by us. 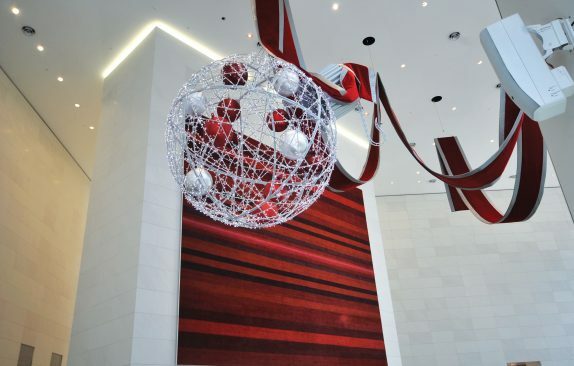 We proposed an oversized suspended meridian ball, embellished with a 10-meter long velvet red ribbon. Weighing in at 300kg, this is not your average meridian ball. The frame was completely illuminated and filled with red and silver baubles. The purpose of this giant installation was to recreate the sophisticated and modern Christmas look that is typical in New York. Our creation was more than a simple Christmas display; it was truly a unique piece of art in its own right. Before we design any of our visual merchandising displays or corporate Christmas displays, we always start with a mood board to find inspiration. We also take the time to make site visits to ensure the display we create will fit harmoniously in the space. In the case of 108 St George’s Terrace there wasn’t a lot of ground space available, which drove us to be innovative and create the New York style Christmas with a suspended feature item. 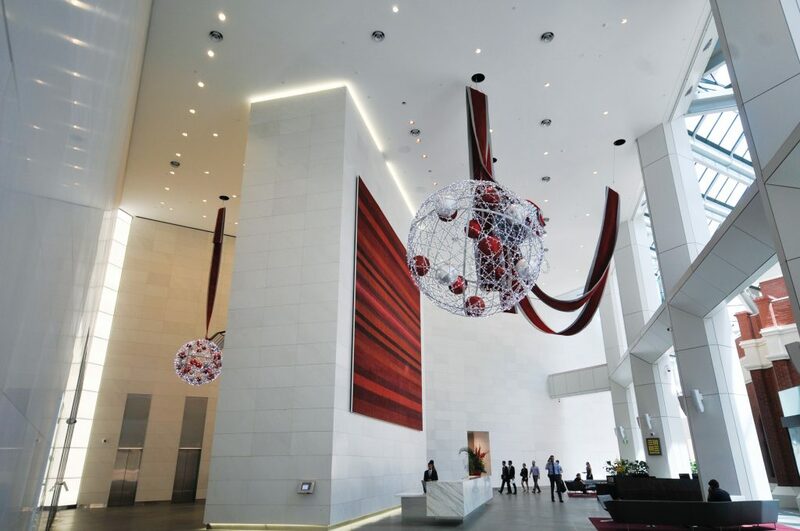 The installation required a team of eight people and took our Perth creative agency almost eight hours to complete. A permanent rigging system in the ceiling allowed us to hang the main bauble safely and have it suspended with the ribbon. 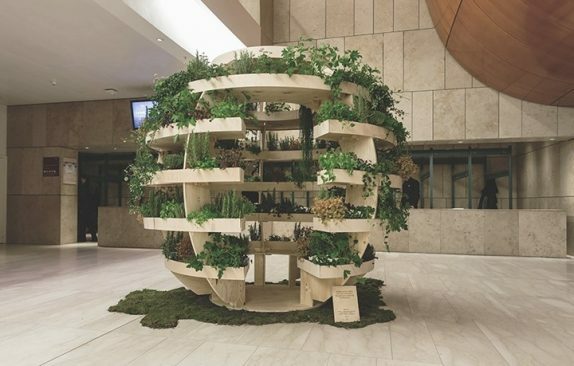 A smaller bauble was hanged on the other side of the foyer and the 2 bauble pods were positioned around the space. By taking our time and valuing attention to detail throughout the process, we were able to use the area available to create a consistent theme throughout the client’s space. Creating perfection is not easy and never happens by accident. We know that time, care and thought must be put in to achieve exactly what you want for your business. We received great feedback from both clients and visitors. A New York style Christmas theme is not something you see very often in the Australian summer and the feedback from visitors reflected this. The bauble was eye catching and as word spread about its weight and amazing suspension, visitor number swelled throughout the Christmas season. We are very proud of our team. Our passion is what drives us every day, in every project, to deliver the most unique and bespoke displays. Activating a commercial space is just the beginning of what Visual Inspirations can do for your business. Our team is skilled and experienced in retail displays, mall equipment, marketing events, large Christmas decorations, creative consultations, design and more. If you’re looking for a unique, creative and customised solution for your business, get in touch with Visual Inspirations.